The Platinum Ergoflex Series of Stacking Banquet Chairs offers incredible comfort with a unique Ergoflex back mechanism. This series of Nufurn banquet chairs are designed for superior performance, durability, and reliability. Nufurn's banquet chairs are the next generation of banquet seating, and can be customized to meet your needs. 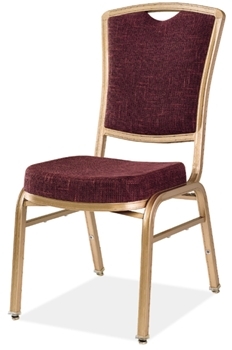 Each of Nufurn's stacking banquet chairs is manufactured to meet our client's specifications. In addition to the chair shown on this page, we offer a large range of Nufurn powdercoat colors and fabric finishes that can be applied to your banquet chairs. Alternatively, we can customize your stacking banquet chairs in your preferred fabrics and powdercoat colors as well as design banquet seating specifically for you. Nufurn's banquet chairs are manufactured with a fully welded steel or next generation aluminum frame, and all Nufurn stacking banquet chairs come with our exclusive 12 year commercial warranty.